I enjoy the idea of creating a painting which can be looked at from more than one point of view. With each turn one discovers a different aspect of the picture. This reminds me that there is always more than one way to look at life. A.R. 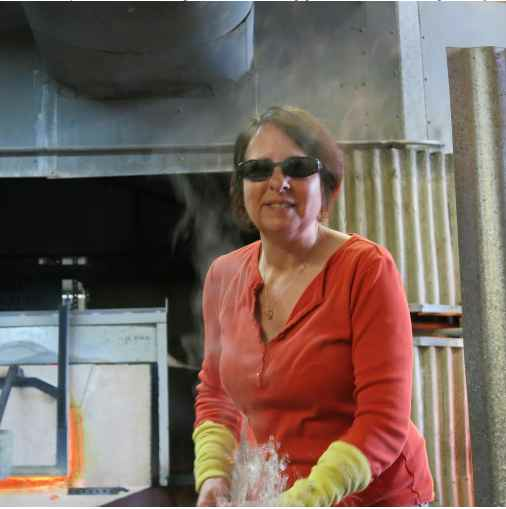 Ohio born, New York based multimedia glass artist Alison Ruzsa has been working in her chosen field for the better part of three decades. Alison graduated from the University of Cincinnati in 1991 with a degree in Fine Arts, having studied painting with an emphasis on sculpture. She has also studied horticulture in depth. Shortly after graduation she moved to New York to begin her career at the New York Experimental Glass Workshop, where she first became fascinated by challenging techniques such as incorporating painted inclusions in works of glass. About that time Alison attempted her first multi-layered piece, an experiment that developed into a decade long exploration of the techniques that today earmark her approach to the creation of glass sculptures. Even before that Alison had already been accumulating experience in the world of glass working as a teaching assistant at the Golden Glass School and Studio (Cincinnati) beginning in early 1990. Alison learned from, worked in and taught at a variety of schools and studios over the next decade, in the United States and Italy. In Italy she served as a teaching assistant and partook of group projects with other glass artists. She exhibited in the Aperto Vetro, an invitational exhibition of international glass, in 1998. In England last year (2016) Alison was a visiting lecturer for the Northern Paperweight Society. Among many other venues, Alison has been represented at the prestigious SOFA annual fall exhibition for much of the last 20 years.Well into her third decade of teaching classes, operating studios, exhibiting widely, and most important, creating her signature works of glass. Aided by a wry sense of humor and quick wit Alison Ruzsa is forging ahead in multimedia glass art creation.